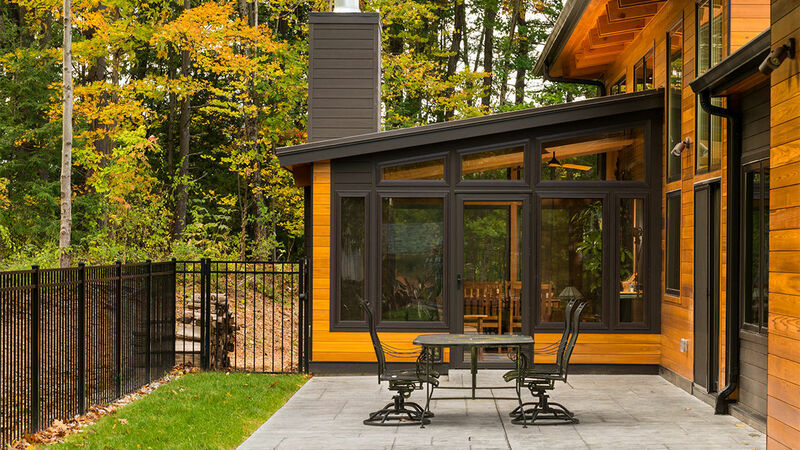 It took two years of planing and another two years of construction to complete this AIA Award-winning timber-frame house in Saratoga Springs, NY. The steep 90-ft. by 270-ft. lot overlooks Loughberry Lake, which makes for a pretty setting but a challenging building site. The 14-ft. grade change was compounded by the fact that the homeowners requested a single-floor-living plan to accommodate mobility restrictions. The long linear lot also came with a lot of setback restraints. “That set the geometry of the house,” says Brett Balzer, principal of Balzer & Tuck Architecture, noting the atypical volume shifts and long overhangs. The empty-nesters were looking to build a modern house reminiscent of one they had lived in years ago. 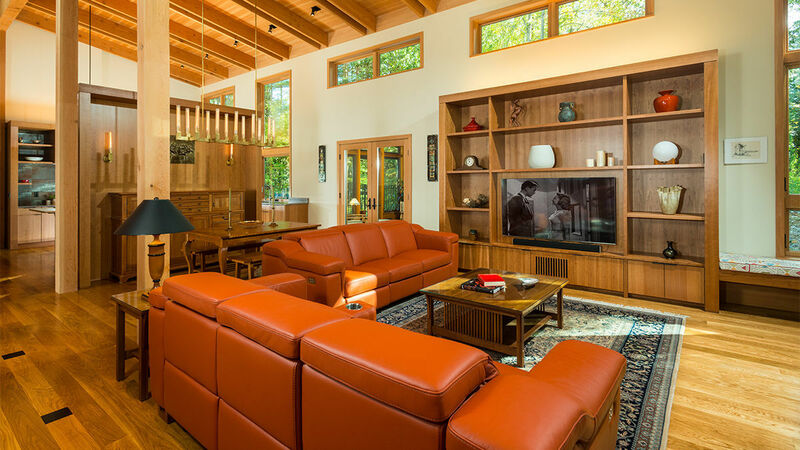 They referenced Frank Lloyd Wright’s architecture to express their fondness for a contemporary aesthetic and natural materials. To work with the site and to help get the look they wanted, the foundation was built with local stone, which “locked the house into the landscape.” The only exposed foundation is at the front, lake-facing elevation, and locally quarried boulders were used for retaining walls. Cladding is cedar with a Benjamin Obdyke Cedar Breather underlayment for the rain screen system. To minimize structure and maximize glazing, the team customized Andersen Windows’ E Series. Another talent on the team was the husband, who is a millworker. Using wood throughout the house was paramount. 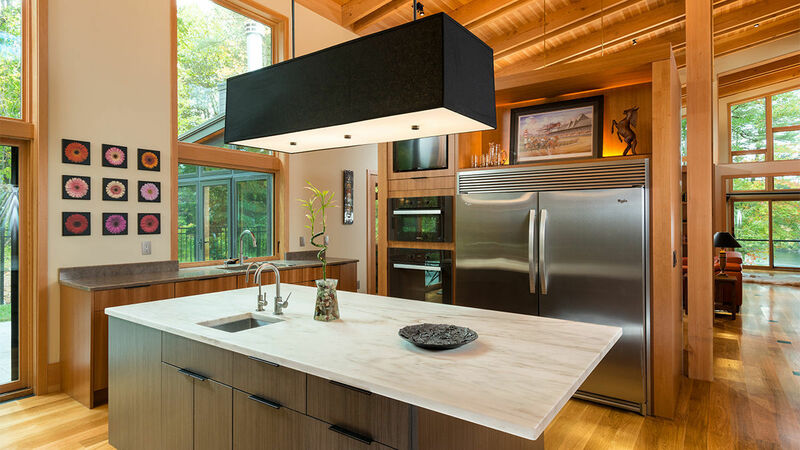 He created super clean lines with simple, flush-panel cabinetry with hairline joinery. The timber posts and beams work well with the cherry millwork to define the spaces, creating rich and layered architectural interest. 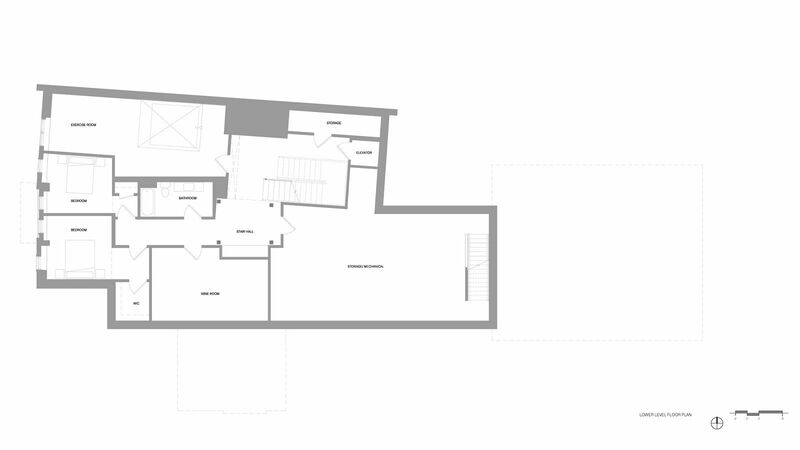 Of note is the freestanding millwork unit between the kitchen and living area; it doesn’t reach the ceiling in order to allow the height of the house to read across its entire width. 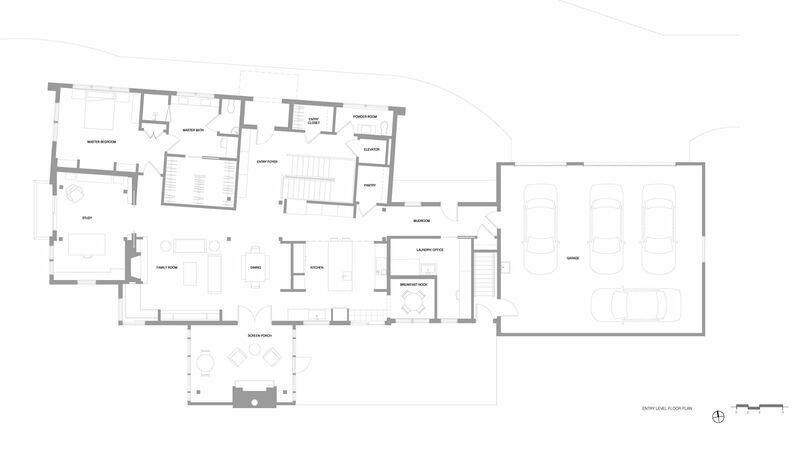 It also breaks up the floor plan so as not to have one uncomfortably cavernous space. 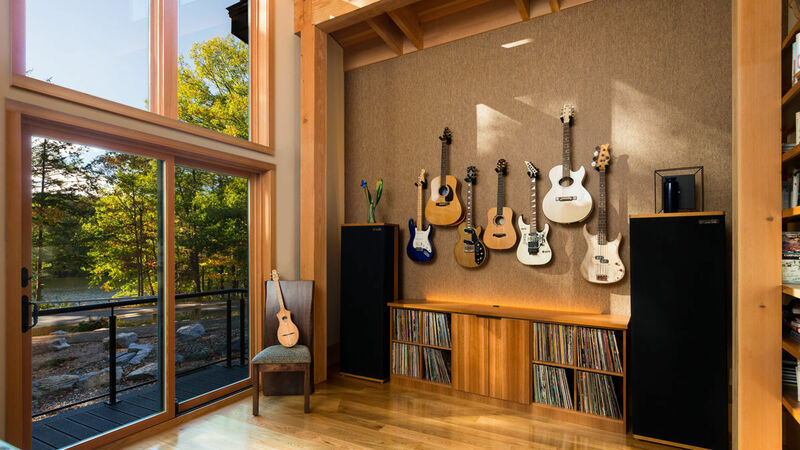 The fireplace separates the living area and office/music room, which sits lakeside. The design allows light to spill through that wall and prevents the fireplace from appearing to be the end of the house. Brett describes this treatment as another one of those easy-to-draw-but-complicated-to-build elements. 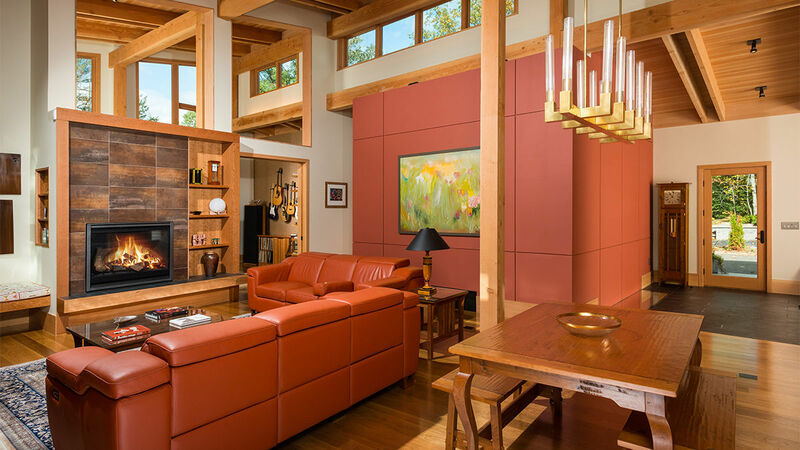 The couple labored over the location of every door and window and every fixture—tailoring the house to suit the way they intended to live in it. Brett notes that the kitchen was specially designed to accommodate their height difference—the husband is over 6 ft. tall while the wife is close to 5 ft. 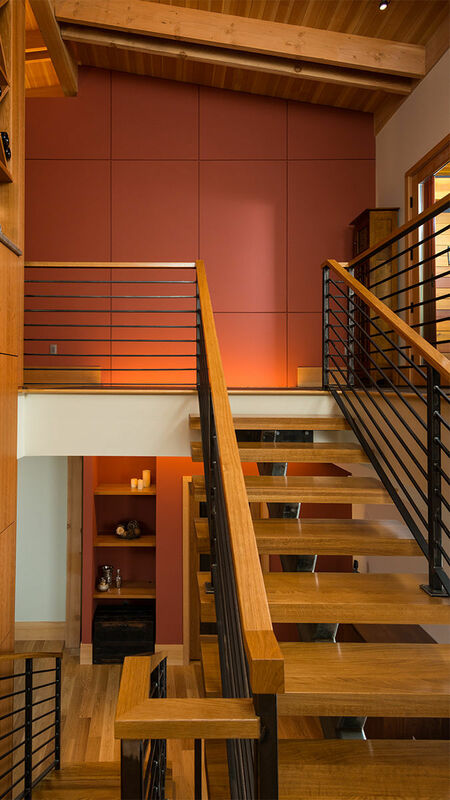 Although the house is designed for one-floor living, there is a lower level with two guest bedrooms, a fitness area, and a therapy pool, which is accessible by elevator or an ornamental stair off of the main entry foyer.